The 20 Gallon InfuSsion™ Mash Tun from Ss Brewing Technologies is targeted at serious brewers wanting to mash in an insulated stainless steel tun that has great thermal retention, a sloped bottom with center drain, a recirculation port, a manometer, LCD thermometer, high quality 3 piece ball valve, and innovation optional accessories such as a vorlauf attachment and a RIMS re-circulaton mainfold. By locating the drain port in the middle we are able to get better uniformity and efficiency through the grain bed versus traditional plastic cooler setups or even herms/rims systems which all typically draw off of one side or another - not the dead center /bottom of the tun!. And of course the manometer lets you optimize your flow rate and is yet another pro brewing feature (like the center drain) we are bringing to the home and nano brewing market. Our optional sparge arm will also work here on this unit as will the optional MTSs (Mash Temperature Stabilization system). 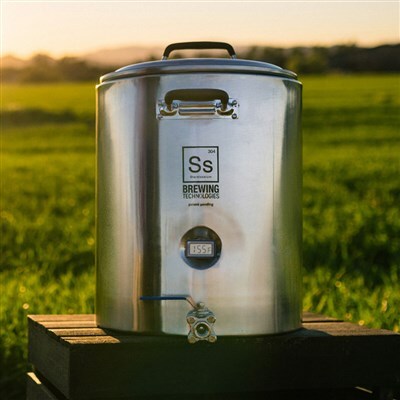 Ss Brewtech’s new 20 gal InfuSsion Mash Tun is one deadly serious piece of brewing equipment that will bring you years of great brewing and great beers!